This delicious poke cake recipe from scratch is so simple to make. If you are a fan of jello poke cake recipes, you will want to try this fabulous strawberry poke cake recipe! 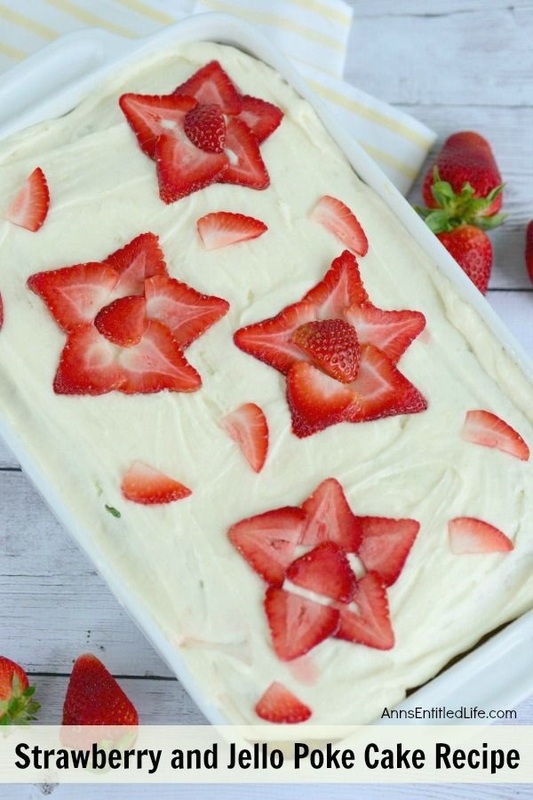 Dressed up in red, white, and blue, this strawberry and jello poke cake has a list of easy to follow instructions to customize your cake as you see fit. Bake and serve this mouthwatering poke cake tonight. Yum!! On this easy to make poke cake, a few little extras go a long way! Forming flowers from strawberries is a simple way to dress up any cake. It looks especially appealing in the spring and summertime. 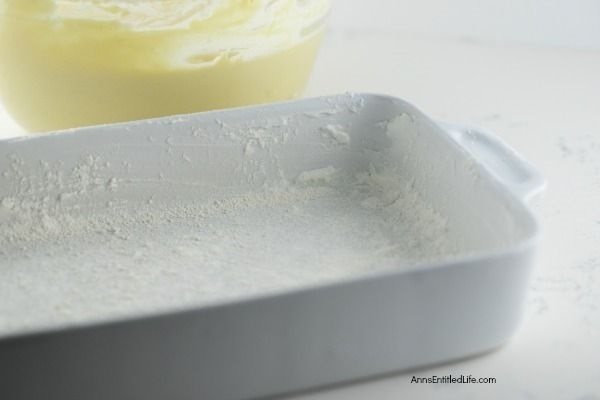 • If you are not certain how to grease and flour a baking dish, click here for directions on how to grease and flour a baking pan! 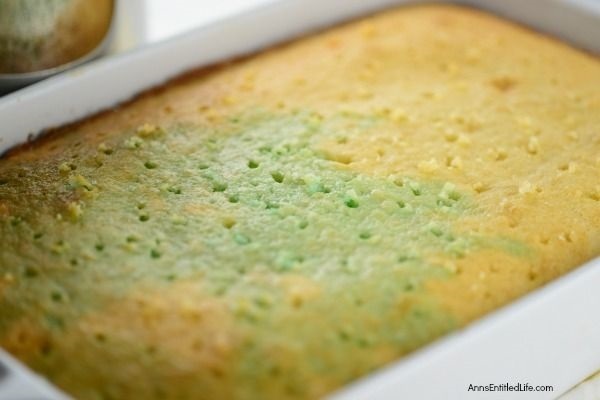 Because this poke cake is not removed from the 13×9 Baking Pan you do not use wax paper on the bottom of the pan! A simple grease and flour for easy serving is all that is necessary. • As with all poke cakes, the color/flavor of jello is subjective. This cake is basically red, white and blue. You could certainly use strawberry jello for an even strawberry-er tasting cake. And yes, if you like you can substitute sugar-free jello. • This cake recipe is from scratch. If you prefer a box cake mix, go for it! Just use a white cake mix so your guests can see the blue streaks from the jello. • My wonderful (I’m not at all biased) Classic Vanilla Buttercream Frosting Recipe was used to frost this cake. It is a simple, delicious recipe. If you choose, you can tint the frosting, as well as swap out the vanilla for strawberry extract (again for a stronger strawberry flavor). 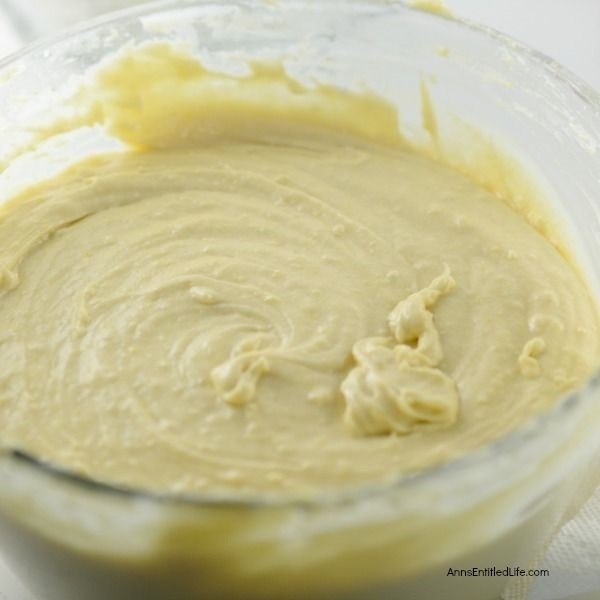 • Interested in making your own vanilla extracy? Click here to learn how to make vanilla extract! • Stand Mixer, bowl and beaters. • Grease and flour a 13″x9″ pan. Set aside. • Sift all-purpose flour and cake flour into a large bowl. 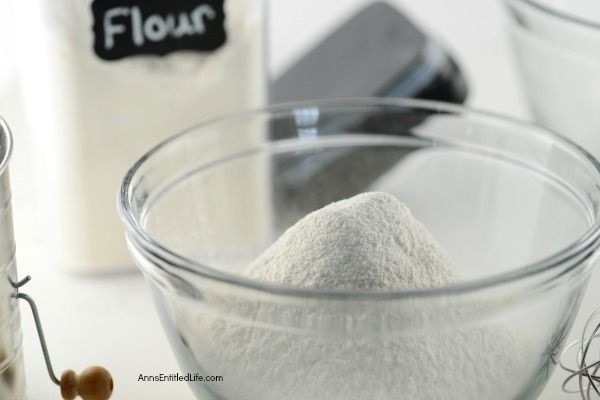 • Add the baking powder and salt to flours, stir and set aside. 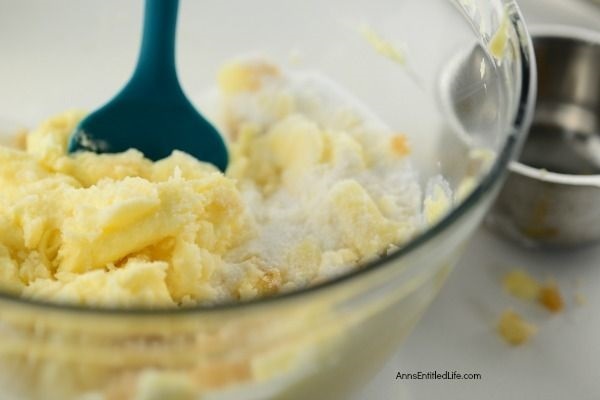 • Using a stand (or hand) mixer, combine granulated sugar and softened butter until smooth. • Add eggs one at a time until combined. • Add half of the flour mixture, combine. • Add one cup of milk; mix well. • Add in remaining flour, combine. • Add remaining ¼ cup of milk. Mix until well combined. • Pour batter into prepared cake pan. 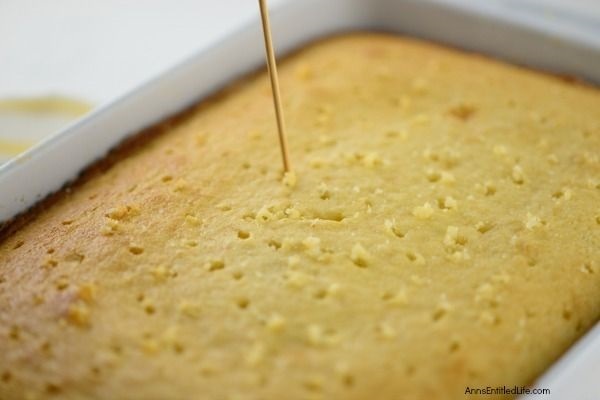 • Place cake batter into preheated 350° oven for 35-40 minutes or until an inserted toothpick comes out clean. The top should be golden brown. • Remove cake from oven and place on a rack or on the top of the oven (do not remove from pan). • Bring one cup of water to a boil. Once the water comes to a boil, add the small box of blue jello. Stir it until everything has dissolved. Then turn off the burner and add in the remaining ¼ cup of cold water. Stir; remove from burner and set aside. • Poke your cake. I used a kabob skewer. You can use the back of a wooden spoon too. Once you are happy with your pokes, pour the jello mixture over the top of the cake. • Place the poke cake into the fridge to chill for about 30 minutes. • While the cake is chilling, whip up some buttercream frosting. This best ever buttercream frosting recipe was used to frost this cake! • Once the cake is cooled, frost with buttercream frosting. 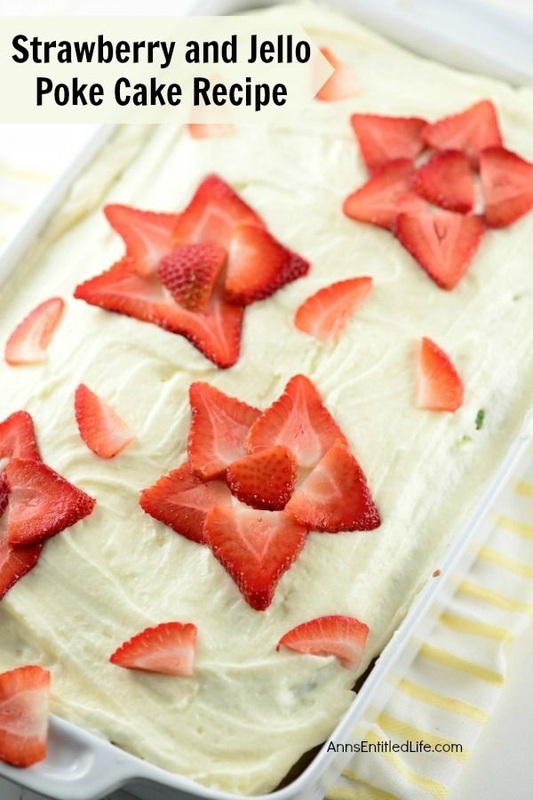 • Slice your hulled strawberries into thin slices and place them on a the frosted cake. Arrange to look like a flower. Dot with a piece of strawberry to form the center of the strawberry flower. This delicious poke cake recipe from scratch is so simple to make. 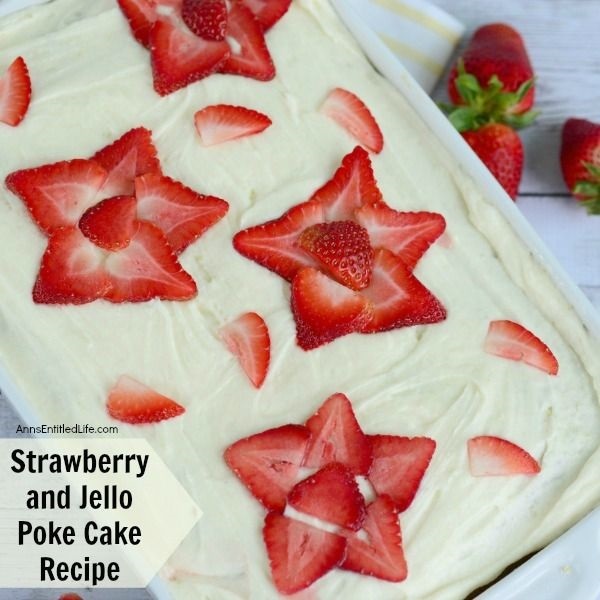 If you are a fan of jello poke cake recipes, you will want to try this fabulous strawberry poke cake recipe! 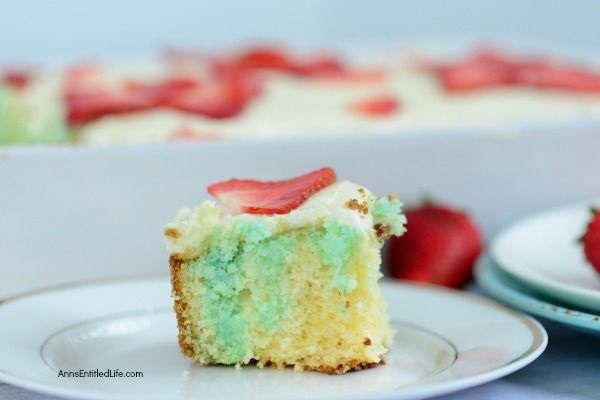 Dressed up in red, white, and blue, this strawberry and jello poke cake has a list of easy to follow instructions to customize your cake as you see fit. Bake and serve this mouthwatering poke cake tonight. Yum! • While the cake is chilling, whip up some buttercream frosting. 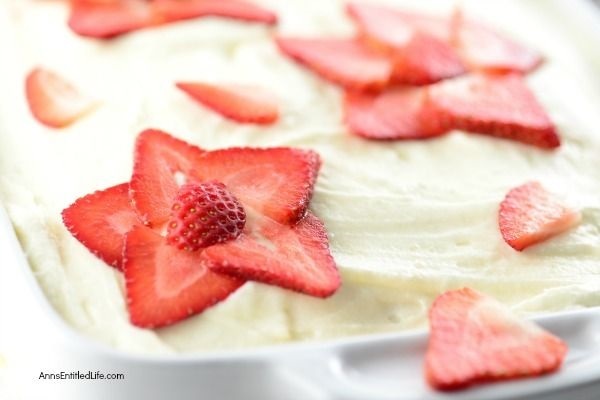 • Slice your hulled strawberries into thin slices and place them on the frosted cake. Arrange to look like a flower. Dot with a piece of strawberry to form the center of the strawberry flower. 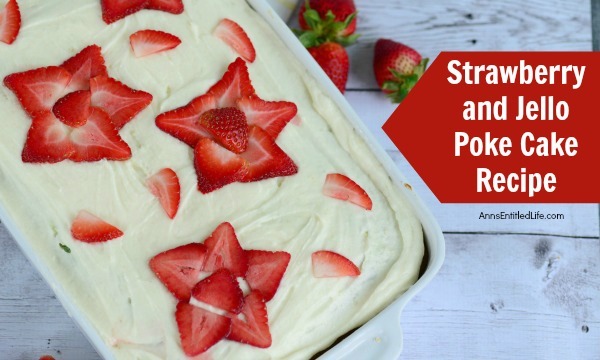 • To print the Strawberry Jello Poke Cake recipe click here. • Strawberry Breakfast Sandwich Recipe – Sweet, delicious strawberries, creamy mascarpone, and a fantastic pound cake make for one fabulous breakfast! Or, eat this tasty strawberry sandwich treat as a dessert. Simply marvelous! • Strawberry Rhubarb Galette Recipe – Using fresh (or frozen) fruit, this pretty galette dessert is easy to make, but impressive to serve – not to mention super tasty! Make it for a treat tonight! • Strawberry Tart Recipe – A visually stunning presentation, this strawberry tart is actually simple to make. Make this strawberry tart for dessert, to take to a party, serve with tea or for anytime really. Your friends and family will be impressed. Only you will know how truly easy this strawberry tart recipe is to prepare!